Just cook pork chop with ginger-flavored soy-sauce and put on cooked rice. In Katsuyo Kobayashi's book it's called "NIKU GOHONÓ, but my sons' always call it "NIKU BENTOU", so it's called that in my family. I usually prepare about 270g for my family. Pork for Shabu-shabu is easy to cook. In Katsuyo's recipe, it's uses 1 tablespoon soy-sauce, Sake and Mirin(sweetened Sake) for 100g pork, but we don't like the sweetness of meals. So we don't use Mirin and add extra Sake as a substitute for Mirin. Chop ginger into fine strips, and cut pork into bite size(40-50mm). Soak the pork in sliced ginger, Sake, and soy-sauce for 5-10 minutes. While it is soaking, let's cook other dishes. Put cooked rice in each lunch-box and place them on a "non-ice" pack to cool down first. 3 Let's cook the pork. First boil the Sake for 10-20 seconds. Amount is always about. Add sliced ginger and soy-sauce. Fry sliced pork keeping them straight in the pan, and brown both sides. If there isn't enough sauce, add a small amount of water. While letting pork cool, spoon the sauce onto the rice. Put the straighten pork on the rice. 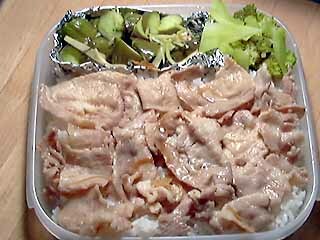 Sometimes we use 100-130g pork for Atsushi's lunch-box. It's finished. A garnish for NIKUBENTOU is usually light dishes, like Cucumber pickles. In a summer, most foods are very easy to sour. Cool rice and pork down well using "non-ice" pack.